Don't miss your chance to see Lauren Salazar perform in Midtown Live! For Lauren, the most fulfilling part of performing is making a real difference for people through her performances. Lauren Salazar is a singer/actress from Houston, TX. She was most recently seen by Houston audiences on the TUTS stage as Gertie Cummings in Oklahoma! for the 50th Anniversary season. At other various institutions, she has appeared in Into The Woods (The Baker's Wife), Chicago (Mary Sunshine), Evita (Eva Peron), The 25'th Annual Putnam… (Olive Ostrovsky), and Les Miserables (Eponine). Lauren describes her feelings about being a performing artists: "I have always loved performing, ever since I was a little girl... It's something I've always wanted to do. It's what gives me the most happiness... being on stage, telling a story for an audience, giving them the chance to feel something, or even just escape for a little while... it's the most thrilling thing. Because you have the ability to change people's days, sometimes even their lives! But even if you just make a small difference... I think that's what I love most about it." She wishes to thank her wonderful family, friends, and teachers for their constant support! Don't miss your chance to see Heather Buzonas perform in Midtown Live! She caught the performance bug all the way back in 8th grade, and she's been hooked ever since! Heather Buzonas is a graduate of Sam Houston State University with a degree in Music Education, and she is in her 8th year as a full-time middle school choir director in Cy-Fair ISD. As of late, Heather has been music directing more frequently than acting, and Midtown Live [four] is her first stage performance in over a year. Favorite on-stage credits include: Little Shop of Horrorswith Clear Creek Community Theater; American IdiotandSilence! the Musical with SRO Productions; originating the role of Mrs. Wiltshire, assistant music directing, arranging, and being a part of the entire creative process for a workshop of a new musical, Billy Reed, at Stageworks Theater; Dirty Rotten Scoundrels at the Owen Theatre; and several opera roles at SHSU. Music directing credits include: We Will Rock You, The Little Mermaid, Jr, and Elf, Jr with Stageworks Theater’s Acting Academy; Avenue Q: High School Edition,Heathers the Musical: High School Edition, and The 25th Annual Putnam County Spelling Bee with Iconotheatrix, for which she was nominated for Best Music Direction in the 2017 Broadway World Houston Awards (Heathers and Spelling Bee); and Assistant Music Director for Little Shop of Horrors with Clear Creek Community Theater. Heather shares an early memory of performing: "My first memory of performing for an audience was singing 'Everywhere' by Michelle Branch in the 8th grade at the choir pop show. I know I had done performances before that (if you count the living room! ), but singing in front of a real audience for the first time is where I'm pretty sure I caught the bug. It was the biggest rush I had ever felt, and I knew I wanted to keep doing it!" Heather would like to think her family and close friends for their continued love and support. It is because of their willingness to put up with her crazy schedule and constant exhaustion that she is able to keep doing what she loves! 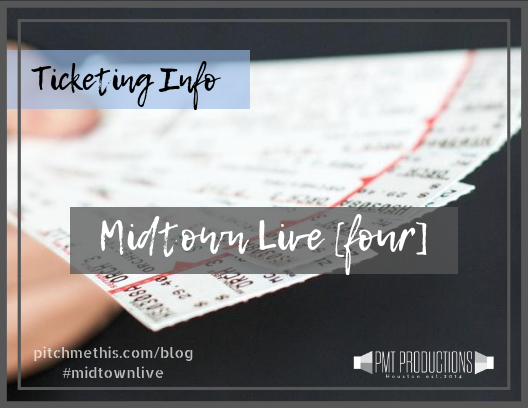 Midtown Live [four] tells the real-life stories of cast members through live musical theater and pop music performances. Betty Le shares how she was reminded of this meaningful song from her past. "I was looking for a song that spoke about strength in the midst of criticism and turmoil. I don't recall the very first time I heard it, but when I was looking for songs that portrayed the message I want to convey, it resurfaced, and reminded me of when my best friend choreographed a dance to it when she was coming out of a difficult time in her life. It felt so special. It was a perfect fit for my message and my story, and with the changes I made to it, the song really hit home for me. And I hope it also hits home for people like me." Don't miss your chance to hear Betty Le tell her real-life story through her performance of David Guetta's "Titanium." You've learned about the casting process, the inspiration behind the set list, the venue, and the history of our signature event--but what exactly is Midtown Live? See what ML4 cast members have to say about it. "Midtown Live is a show where the singer is portraying his or herself, instead of pretending to be a character from someone else's imagination." "Midtown live is a collaborative showcase of local talent." "Midtown Live is all about a group of artists coming together to tell their stories, while giving incredible performances and singing their faces off for anyone who will listen. It's an awesome night chock full of Musical Theatre and Pop favorites, and it's going to be a lot of fun, it's so awesome to get to be a part of." "Midtown Live is an opportunity. An opportunity for artists to speak their truth through a personal story and have an audience share in their journey by connecting through their music. Its an opportunity for the audience to come to a show and see through the point of view of a diverse set of performers, and gain perspective to situations they may have never experienced. And an opportunity for Houston to come together and both create and consume art." "Midtown Live is a show where artists can showcase their artistry. They tell their stories and give you a glimpse of what has gone on in their life to make them the performers they are today. It's a show where you hear great, relevant, and relatable music and feel like you know the people singing them." Midtown Live [four] tells the real-life stories of cast members through live musical theater and pop music performances. Seth Cunningham shares how he missed his perfect moment to perform once before. "I found this song years ago in school and prepared it for the perfect moment that never came... until now. I love how expressive the words and the music allow the singer to be. When I sing this song, I'm free." Don't miss your chance to hear Seth Cunningham tell his real-life story through her performance of Scott Alan's "Please Don't Let Me Go.". Shannon Nichols is an integral part of the Midtown Live [four] production team--and the PMT team in general. As Production Director, she is tasked with keeping productions on track and up to our PMT standard! Nichols is a Houston-based costume designer, teaching artist, and performer. She has been seen in productions across the Greater Houston area with theaters including Island ETC, Main Street Theater, Art Park Players, and PMT Productions. When she is not performing, she works in the wardrobe department of The Alley Theatre and as a Teaching Artist with Main Street Theater. In 2017, Nichols founded PMT Young Artist Series (PMT YAS! ), PMT Productions' youth engagement initiative, which offers musical theater intensive programming for students ages 6-16. In 2018, she purchased a portion of PMT Productions and works as the company's Production Director. "Being PMT's Production Director provides me to perfect opportunity to utilize all of my varied skill sets to help pull together productions. And working with the kids is my passion!" Shannon is part of what makes PMT great! Don't miss your chance to see her hard work pay off in Midtown Live [four]!